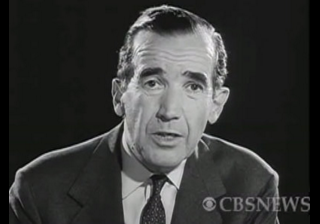 The radio program, newspaper column and TV series, "This I Believe", was originated by CBS newsman Edward R. Murrow. A book version was published in 1952 and included a foreword by Edward R. Murrow. Its cover stated that it contained: ...the personal philosophies of one hundred thoughtful men and women. At the time, the book was well recieved, earning sales exceeded only by the Bible. "A cover description of its contents stated that: ...this book is the further extension of an idea that has already exploded into the most widely listened to radio program in the world. That idea is simple. It is that men and women will live happier and richer lives if they deliberately decide what they want from life — what they want in material things and the relative importance of moral and spiritual things. You, like most people, undoubtedly have certain rules by which you run your life. But, again like most people, you've probably never tried to formulate them, even to yourself. That's where the men and women in this book differ from you. They have at least tried to do so. They have "looked in their hearts and written," humbly and hesitantly, upon the invitation of the distinguished radio and television news analyst, Edward R. Murrow. "After all," says he, "the only way of discovering what people believe is to ask them." What these thoughtful people, in all walks of life, have written is here for you to read and ponder, and perhaps to emulate — in this collection of the 100 of the best of the personal philosophies of life which Mr. Murrow has discovered among the many hundreds contributed to This I Believe - on the air and in newspapers." Today, This I Believe, Inc., a not-for-profit organization founded in 2004, carries on the mission of This I Believe, posting essays written by youth and adults about their core values.